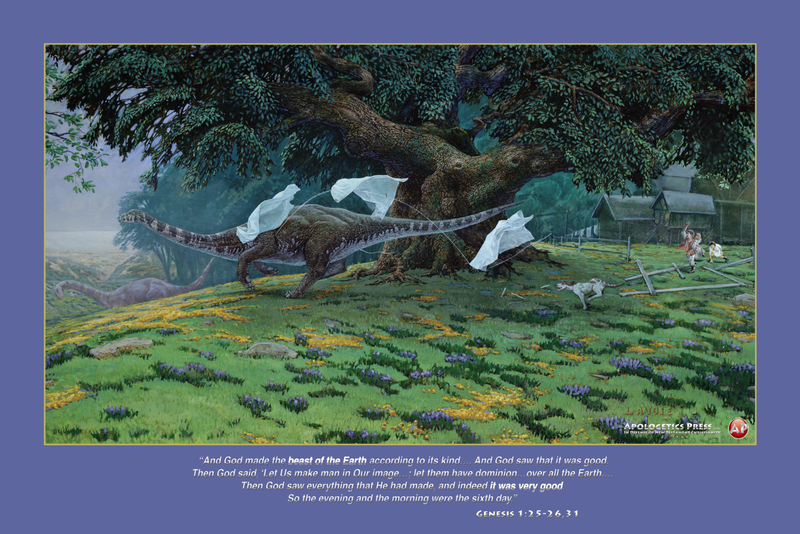 Among the host of products that Apologetics Press has developed over the years, one that is particularly “high impact” is our dinosaur posters. These fascinating paintings, created by Canadian artist Lewis Lavoie, enable the human mind to conceptualize the historical reality that evolutionists adamantly deny: that humans and dinosaurs once lived on the Earth together. The Bible plainly teaches that both humans and dinosaurs were created on day six of the Creation week (Genesis 1:24-31). Both historical evidence and scientific evidence supports the same thesis (see AP’s book The Dinosaur Delusion). These posters are perfect for the walls of kids’ bedrooms and Bible classrooms. They are excellent for decorating dining rooms, living rooms, and entry ways. And you should consider placing one of the A.P. dinosaur posters on the wall of your office as a conversation starter. You will be amazed at the response of those who see it. What individual, raised in the public school system over the last 50 years, with an erroneous, evolutionary view of dinosaurs and history, would not be intrigued by such pictures? Who would not be curious enough to ask questions that inevitably lead to the Bible—the source through which we receive invaluable information that can save our souls? Our latest poster offering is titled “Runaway Ben” and includes relevant verses from Genesis 1:25-26,31. Previous posters are: “Day 40” (Genesis 7:21-22), “Deers in the Forest” (Genesis 1:28), and “Prelude to the Fair” (Psalm 8:4-7). It’s time our children were given more accurate portrayals in their minds of how life on Earth with dinosaurs could have been. Visit our Web site for further information on these beautiful art pieces of Lewis Lavoie who also illustrated our flagship kid’s dinosaur book Dinosaurs Unleashed.